What a handy item this is. If you own a book store, business supply store, or just about any business, this would be a great promotional item for you. This flip top pocket pack comes with 110 assorted colour sticky adhesive flags and a 20-page adhesive note pad. 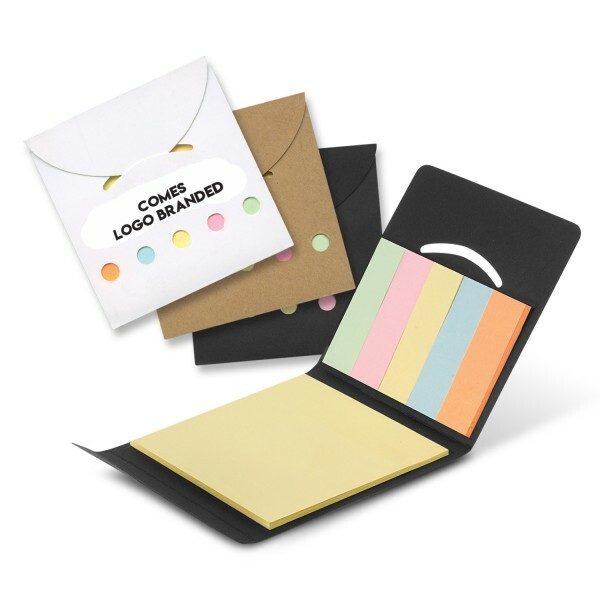 Perfect for the pocket or purse, your logo will be right at your and your client’s fingertips when they need to mark a page or make a note about something important. Your logo will stand loud and proud for all to see. We are a wholesale supplier, so we deal in bulk orders and ship Australia wide. Price excludes GST but does include 1 colour and 1 position printing. There will also be a $60.00 decoration setup fee applied to all orders. There is a standard two-week production time on this item, so why not contact us today? We have a friendly and expert customer service department who will be more than glad to answer any questions or address any concerns you may have about this amazing promotional item. Additionally, we can arrange delivery to your business address or even to the location of your next vendor event or trade show! Contact us today for further details.